LAT: 42:24, no errors. Pretty much the standard weirdness. WSJ: 31:11, no errors. back and check it over. Didn’t understand “flag of Chicago quartet”. Thanks for reminding me! I meant to look it up when I was done and forgot (the story of my life, these days 😜). LAT: 11:20, no errors. WSJ: 30:04, no errors; harder than usual, I thought (but maybe it was just me). Newsday: 46:08, no errors; for me, an odd mix of easy and hard; I spent about half my time in the lower right (but, again, maybe it was just me). 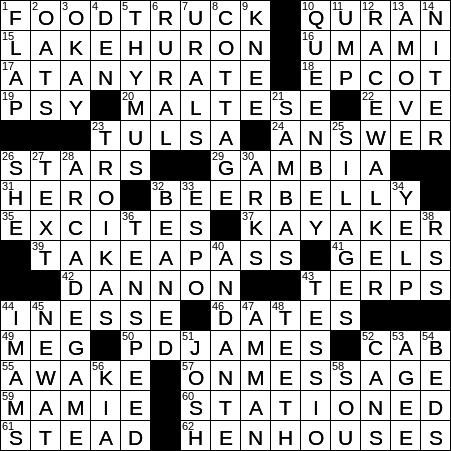 I finished various puzzles rather late last night, but, just before going to bed, I took a short “final” look at the WSJ meta, which I had mostly ignored all day. As I was dropping off to sleep a few minutes later, a key observation popped into my head, so I got up, worked out the answer, and sent it in. A fiendishly clever construction! LAT: SE corner caused some problem but I eventually got it. Screwed up stupidly though on “kayaker.” Entered “QueenBee” instead of “QueenBey” (because I don’t keep up with pop music), which caused the kayaker miss. 53:30 with 8 errors all in the upper right corner. I spelled Quran the only way I had ever heard of it (Koran ) and it went downhill from there. i did better than I thought. But “beer belly” never came to me and had Koran in, so that messed up a lot of things. Well, it’s Saturday so what else is new! five 100’s this week and only 3 empty squares on the other two days. Feeling very self-satisfied as we speak. Kudos to all for your efforts. Right about 16 minutes until I got fed up with the USELESS clues and quit, with probably half the grid filled, maybe less. A new name for my “don’t even bother” list. Life’s too short to waste time on puzzles you simply weren’t ever meant to solve. John Daigle: You’ve got a great family “team” going there! How fun for all of you. That’s what’s great about these puzzles. I always include others in the clues I can’t get. They seem to have fun in helping me out. Mostly it’s the NYT crossword that I have the most problems. So keep on doing your thing. No errors!! Yay! I love a good Saturday challenge– when I have no errors, that is. 😊 Allen, I’m sure I don’t know what you’re complaining about!! I thought this was a well-done puzzle. @KAY! FWIW I never do the puzzle with anyone else! I’m too fixated on getting it right on my own. 😊 I’ll make an exception occasionally for my niece…. Tough Saturday for me; got everything except most of the SE corner after about an hour and 15 minutes. 19 missing and 2 in error, although I should have gotten the ED in BEDS. The rest I just didn’t know. At least I had CABS, CANS, AMMAN, SOU and DATES. Did have to change Afuss to AMOVE and koRAN.